They also make translucent, pink, purple, black, and solid white. 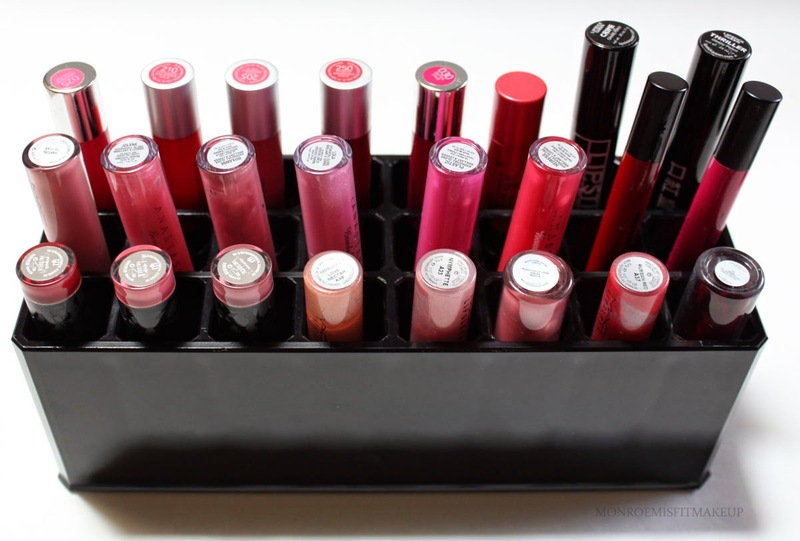 24 Lipstick Organizer : Dimensions: 22 x 9 x 3.5CM or 8.6 x 3.5 x 1.4 inches. Made from high quality grade acrylic, this stylish and durable lipstick holder gives you 24 individual lipstick spaces. 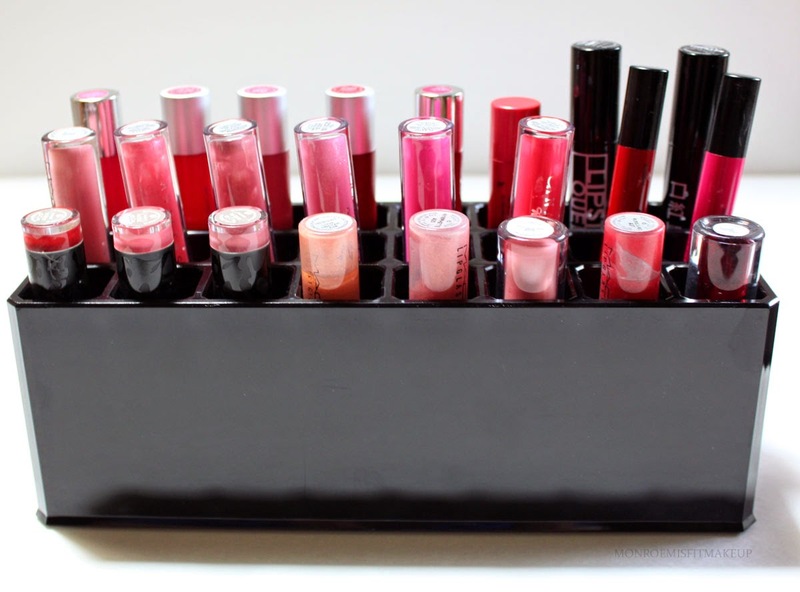 Neatly display your organizer and lipsticks on any counter or in almost any drawer. The organizer is also easy to clean; just rinse with warm water and soap. 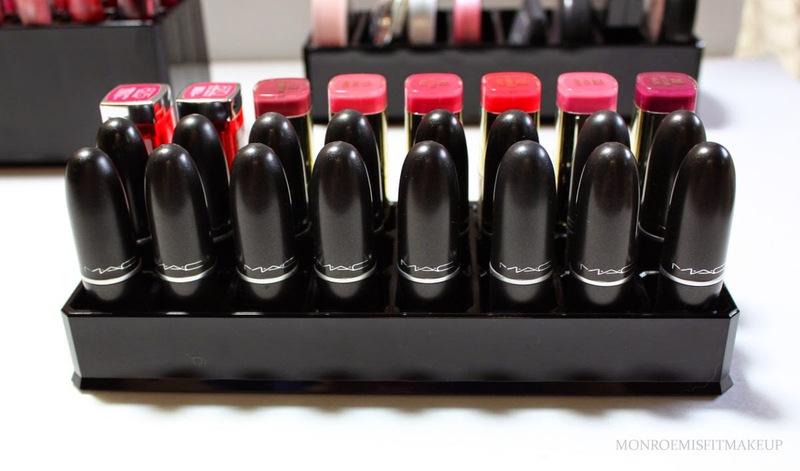 This lipstick holder is gorgeous! The shiny black looks so classy and modern. I normally don't like my makeup out but these look lovely displayed on top of my vanity. 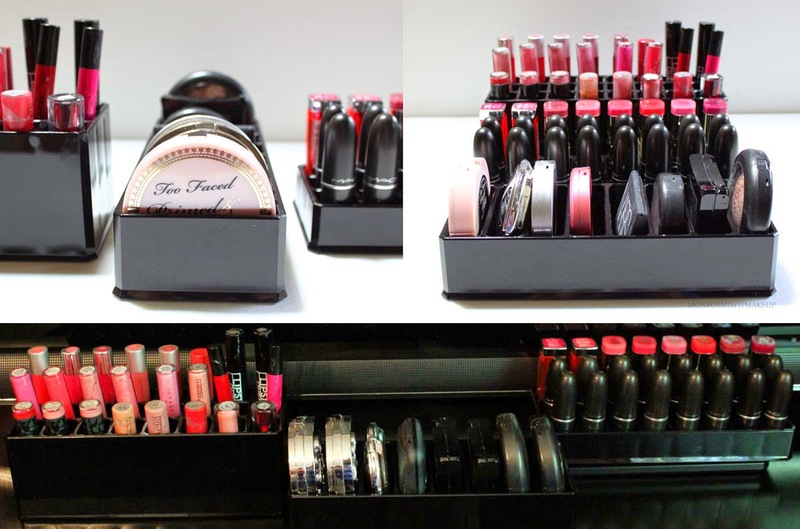 The construction of these organizers is very sturdy and solid, not at all like those cheap acrylic holders you'll find on the bathroom organization shelf. I'm going to need at least 3 more of these babies. Keep in mind if you choose a solid color you can't see the lipstick name on the bottom by picking it up, that is one benefit to the translucent ones. You'll have to sort through your MAC bullets unless you want to pop them upside down which makes them lean, but flat bottomed tube's can be placed upside down. 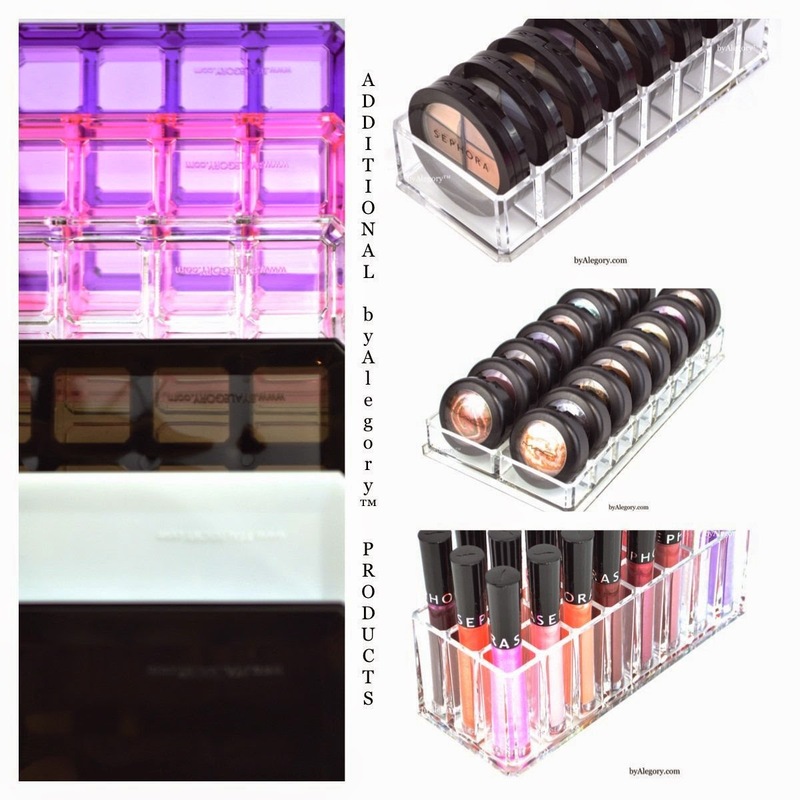 The lipgloss organizer is also made of the same weighty acrylic, you can really feel the quality in these organizers over others. I was most looking forward to the lipgloss organizer as I've never found a good storage solution for them. All of my lipglosses are stacked on top of each other and I never use half of them because of this. This organizer fits a wide range of brands. From short tubed MAC lipglasses, Anastasia, bare escentuals, Senna, to your Revlon balm sticks, Lipstick Queen, tarte lipsurgence, Urban Decay, and Clinique pencils. I know a lot of people have the IKEA MALM dressing tables to store their makeup. I have the larger version and this organizer fits inside perfectly with out the lip glosses hitting on top. If placed close together I think you could manage to put 3-4 of the lipstick or lipgloss organizers together and 4-5 of the compact organizers in to one drawer space. 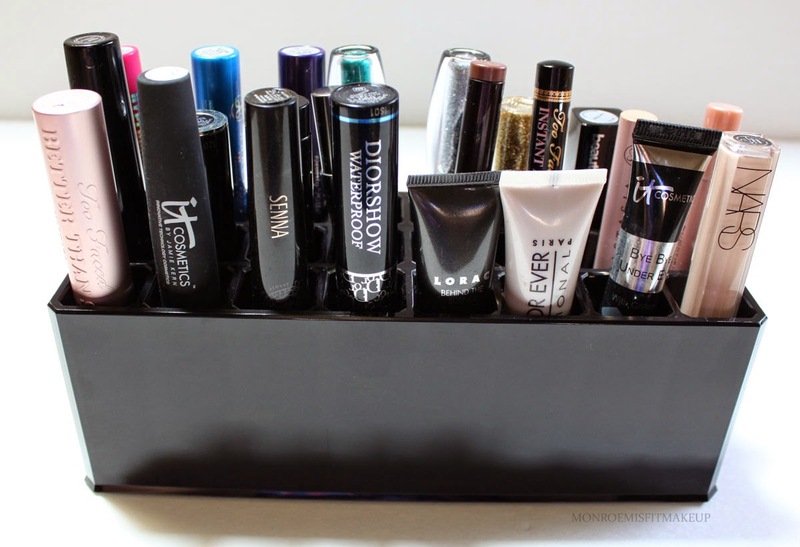 Another organizational use I found for this style is for Mascara, Concealers, Liquid liners, and shadow pencil's. I always have about 4-6 different mascara's and concealers in rotation at any given time and this keeps them all visible and within reach. 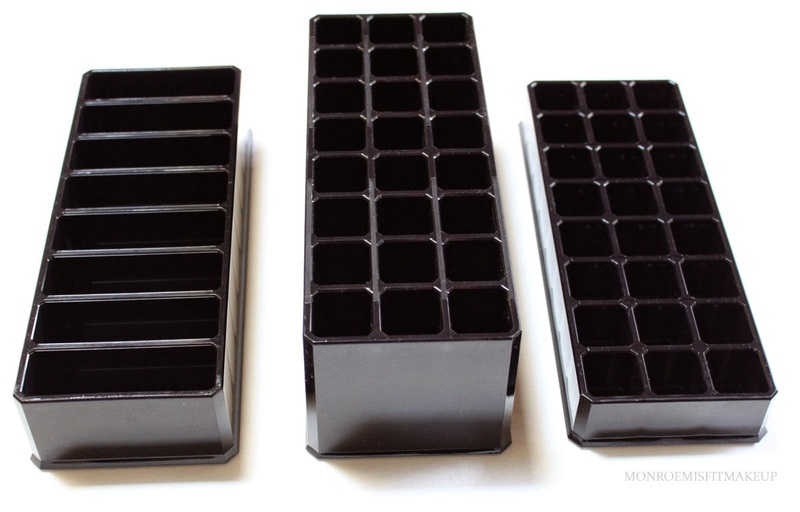 It'd be a great all-in-one organizer for your slim tube products. This Compact Organizer looks a whole lot more sleek than the dollar store pencil holder I was using! It fits most standard size face powders and blushes like MAC, Too Faced, thebalm, hourglass, It, tarte, to square packaging like Illamasqua, and NARS. Even larger items such as MAC Mineralize Skinfinishes fit confortably. A nice feature to this design is the space between so you can see each product. This is especially helpful when filling it with all of the same packaging like MAC blushes, you can see the color without having to search through them all. 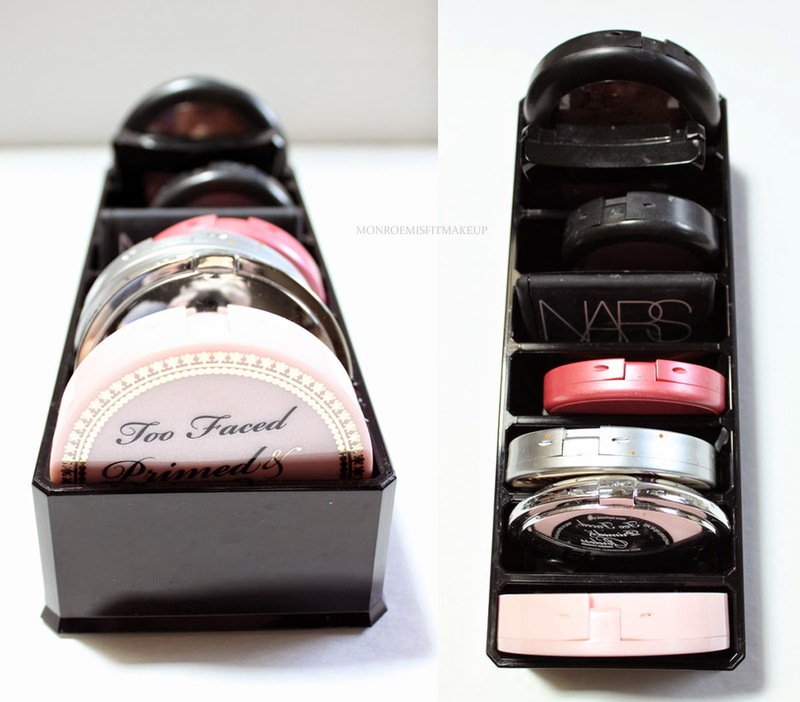 Smaller size palette's or eyeshadow quads also store upright in the compact organizer. Eyeshadow palette's from Sleek, Too faced, kat von d, bobbi brown, and the urban decay naked's. byAlegory organizers are awesome! I think they would be essential to any makeup collection, big or small. The quality you get for the price is amazing, better than any other acrylic organizer I've bought before and they highlight your makeup in such a beautiful way. I will be buying many many more of these. The website says they'll be launching organizers for eyeshadow's and eye and lip pencils this Summer. Can not wait for those! Purchase byAlegory Organizers HERE on AMAZON. There's FREE 2-day shipping with Amazon Prime or free shipping over $35.